When Marjorie Mizrachi founded Hadassah Panama in 2006, the Sarah Wetsman Davidson Hospital Tower was still a dream. Last week the Mizrachi family stood inside that Tower and represented the Jewish community of Panama honoring the late Chief Rabbi Sion Levy and their own devoted family. 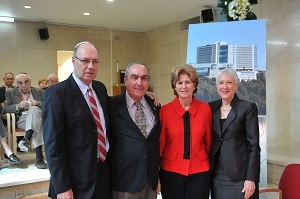 The auditorium of the 19-story advanced medical Tower is named for Rabbi Levy, and the Family Waiting Area in the Surgical Intensive Care Center is named for the Mizrachi family. 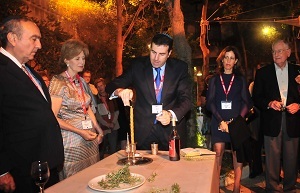 Moy Mizrachi was honored with leading the havdalah ceremony for the pre-mission of the Society of Major Donors, an honor he passed to his son, David.